November is a wonderful time of the year as we welcome the Holiday Season and show how thankful we are for all those who support us throughout the year. Happy Thanksgiving and a very Happy Hanukkah to all! This month we celebrate National Philanthropy Day with our Board of Directors at the National Philanthropy Day luncheon hosted by the Association for Fundraising Professionals. It is a wonderful way for the non-profits in Broward to say thank you to those Philanthropists who go above and beyond to support our work. We look forward to honoring our Board, who’s Vision and Support allows us to serve our clients. We continue that honor on Veterans Day when all Americans show their respect to the men and women who have served our country. 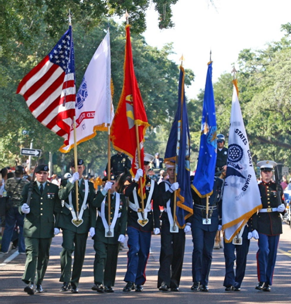 At MonarchCare we are proud to be Americans and say thank you to all Veterans and their families! 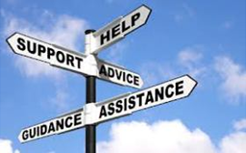 One of the ways we help is through our Advice and Education program, which provides information on services to those in the community who need help navigating the system. 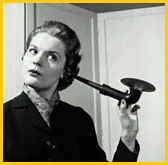 We take numerous calls each month from individuals who need answers and referrals that they have not gotten elsewhere. Recently we took a call from Ms. Darling who needed help for her dad. She called specifically because she had seen one of our care managers, Brillytza, with a client at their doctor’s appointment. She was so impressed with how Brillytza advocated for our client that she approached her and asked who her employer was. Ms. Darling then called to get help making decisions about her dad’s care. She was on the right track with her plans, but wanted a professional who does this all the time, to work through her decision on placement and choosing a facility. 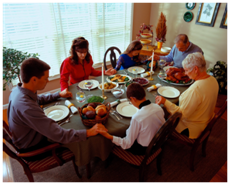 It is often hard for family members to know what to do or where to go. MonarchCare takes our time with clients with the goal to support those in time of need. We were able to provide 255 hours of pro bono service in October. Last December we started a “Holiday Giving Tree” for our clients who would otherwise not receive a gift for the holiday season. Several supporters stopped by to pick a tag off our holiday tree, purchased the item, wrapped it and brought it back. Our Care Managers then delivered the gifts to our clients. This year we will again open our office for you to stop by between December 3rd and 6th (anytime from 2:00 – 4:00PM). We will have special holiday treats for you as you pick a tag off our tree and chat with staff. We ask that you return the wrapped gift to us no later than December 13th. Thank you in advance for any support you can offer in making the holidays just a little more special for our clients who have very little. Some of our clients celebrate Hanukkah and others Christmas, and, although Hanukkah comes early this year, our clients will enjoy the gifts whenever they receive them. National Philanthropy Day®, November 15, is the special day set aside to recognize and pay tribute to the great contributions that philanthropy—and those people active in the philanthropic community—have made to our lives, our communities and our world. In 2013 more than 100 communities and 50,000 people around the world will participate in NPD events and celebrations. These events include award ceremonies, galas, luncheons, seminars and other special events. Outstanding donors, volunteers, corporations, foundations, small businesses, youth in philanthropy and others will be honored on NPD in recognition of their work in improving their communities and their world every day. Visit the official website for more information. In 1926, the United States Congress officially recognized the end of World War I and declared that the anniversary of the armistice should be commemorated with prayer and thanksgiving. The Congress also requested that the president should "issue a proclamation calling upon the officials to display the flag of the United States on all Government buildings on November 11 and inviting the people of the United States to observe the day in schools and churches, or other suitable places, with appropriate ceremonies of friendly relations with all other peoples." Read more about the subsequent establishment of Veterans Day and its commemoration of our veterans of all conflicts. Again this month please support us by printing the flyer and enjoying lunch or dinner at Ruby Tuesday on Commercial Boulevard in Lauderhill from 11/18-11/20. 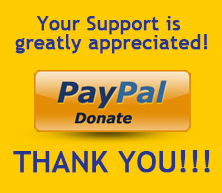 MonarchCare will receive 20% of your check as a donation. Thank you! Our 2014 Transforming Lives Luncheon is just around the corner. We are in the process of forming our task force to plan this wonderful recognition event. If you are interested in helping out please contact Chris at CLevine@MonarchCare.org. Michael D. Wild, Esq. – Wild, Felice and Pardo, P.A. John R. Hurley, Esq. – John R. Hurley, P.A. Just a few days left - $5 New Member Bonus for MonarchCare, Inc. It's as easy as forwarding this email. But time's running out. 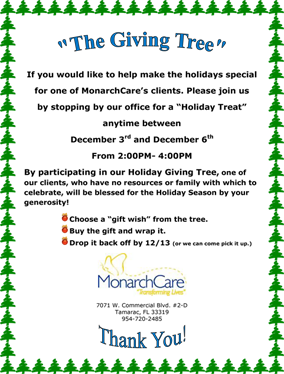 Each person who joins and makes at least one purchase by November 12, 2013 earns MonarchCare, Inc an extra $5. That's in addition to the normal donation amount. It's a great time to help MonarchCare, simply by shopping. 1. Over 1,350 stores participating. Purchases at Amazon count for a donation, but not towards the new member bonus. 2. New iGive members only (never joined before). 3. You must use our special link we've provided below to join. And they must use iGive to visit the store (the Button, the iPhone / iPad apps, or links on our site). Returns don't count.